Lapland is a region that is well known for its winter attractions. From dogsledding to northern lights watching, nearly all of the activities that immediately spring to mind when people think of Finland’s north are only available during the coldest months of the year. Ruka Ski Hill in summer. As a ski resort, Ruka (located just south of Lapland in Finland’s Northern Ostrobothnia province) suffers from this preconception even more. It’s a natural choice for a winter holiday, but not necessarily a place that jumps to mind for a summer getaway, particularly for those based outside Finland. However, starting my Lapland trip in Ruka seemed like the logical choice. It was easy to get to from Helsinki (there are daily flights to nearby Kuusamo on Finnair) and it had so many activity options that it was going to be hard to fit them all into three days. Plus, considering that I had only ever visited ski resorts in summer until my mid-twenties, going there in summer seemed pretty normal to me. Rafters take on the Myllykoski rapids in Oulanka National Park. As I expected, my time in Ruka was jam-packed, and the less-than-ideal weather didn’t hinder it in the slightest. And, even though I spent the next three weeks exploring every far corner I could find in Lapland, a number of those experiences were unique to this area. So if you had a few days to spend here, what would I recommend you do? 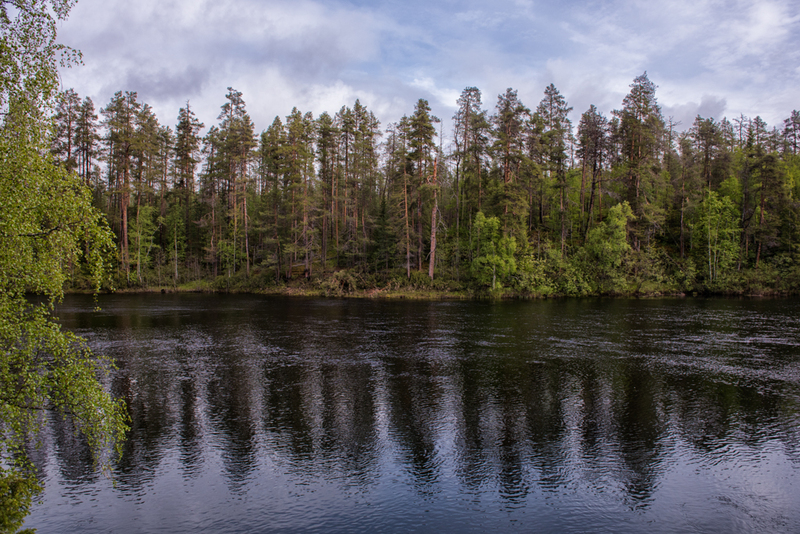 Reflections in Oulanka National Park. Oulanka National Park (Finnish: Oulangan kansallispuisto) is not actually in Ruka itself; it’s actually on the border with Lapland and about a 30 minutes drive to the northeast. 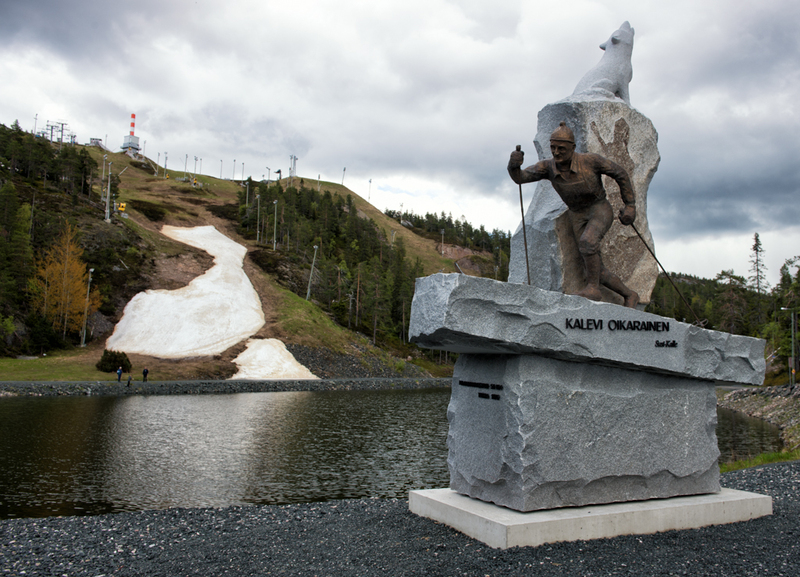 However, it’s an absolute must-see when you’re in the Ruka area, and it’s actually what drew me to visit in the first place. This national park is one of the most dynamic that I visited in Finland’s north. The rivers here, particularly in early summer when the last of the winter snow was melting off the fells, were intense, deafening, and absolutely mesmerising to watch. I went walking in two distinct areas of the national park, and its impossible to recommend one over the other. 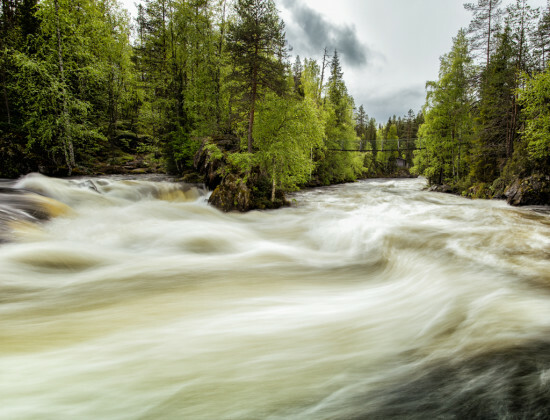 The Oulankajoki, in flood after a good winter meant lots of snowmelt, races through Kiutaköngäs Falls in Oulanka National Park. Kiutaköngäs is located on the Oulanka River about 2km from the Oulanka Visitor Centre. I highly recommend a stop at the Visitor Centre as the exhibition there is filled with interesting information about the native inhabitants of the park, including “dual national” brown trout that migrate between Finland and Russia and the “mysterious brown bear,” which lives along the Karhunkierros Trail but is rarely, if ever, seen. The walk along the Oulanka River to Kiutaköngäs was a stark contrast to being at the waterfall itself. The silence of the forest was broken by the faint rushing of water, the crackle of sticks underfoot, and the calls of birds, but very little else. A WWII-era shelter hiding in the hills alongside the track to Kiutaköngäs. By the time we got to Kiutaköngäs, we had to yell to be heard over the din; it was crazy to think that, the month before, the waterfall had been even more intense and had flowed over the rocks we were standing on, many meters above where the waterfall now crashed. 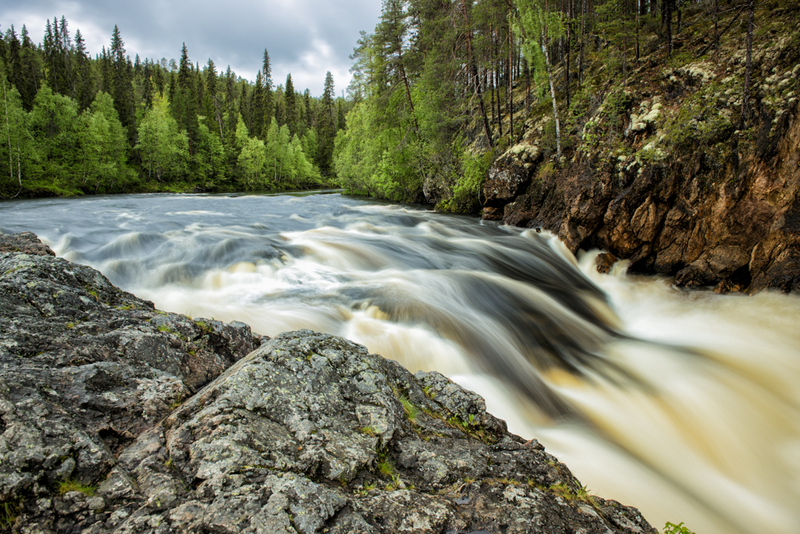 After having travelled through the rest of Lapland, I would still rate Kiutaköngäs second only to Ravadas Falls in Lemmenjoki National Park. The crush of the Myllykoski rapids on the Kitkajoki River. The Pieni Karhunkierros Trail is located further to the south in Oulanka National Park, and is much shorter than its namesake trail (Pieni karhunkierros roughly translates to “small bear round” while the Karhunkierros simply means “bear round”). At 12km — instead of the 80km of the Karhunkierros — it’s much more manageable for travellers that would like to experience the trail without having to deal with the logistics of overnight hikes. This track takes you through the forest up to the top of steep cliffs with sweeping views of the roiling Kitka River below. My favourite section was the Myllykoski Rapids, where you can stand just above the water on a patio and look out at the class 4 rapid beyond. 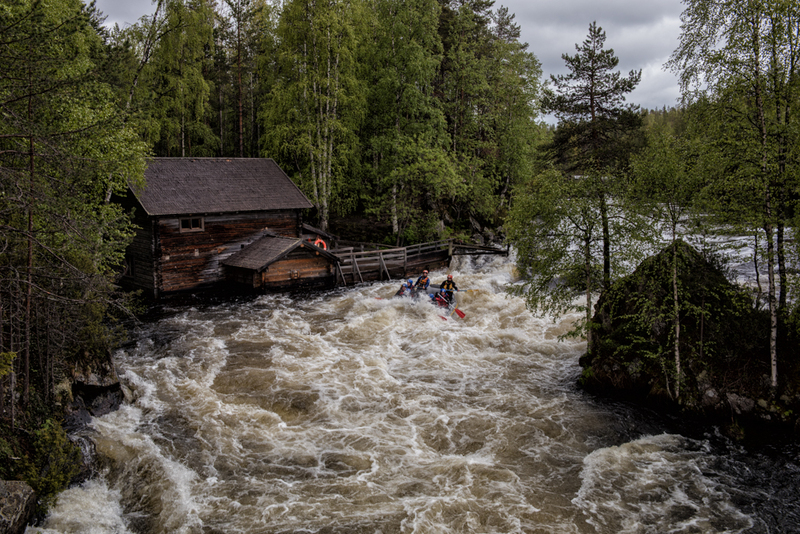 This rapid is the largest commercially raftable rapid in Finland, and the one raft I saw actually went underwater before successfully shooting out the other side. There was no wiping the grins off the rafters’ faces as they floated underneath the rope bridge just beyond the rapids. 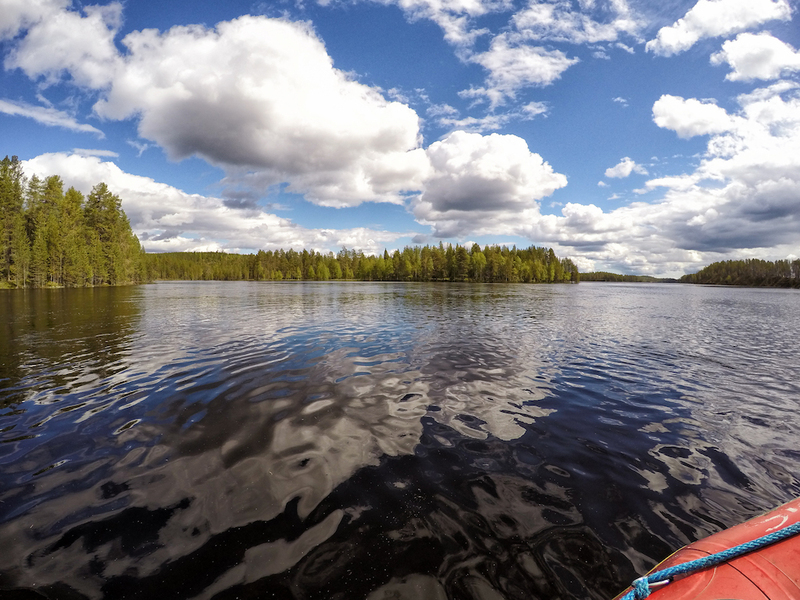 Speaking of white water rafting, there are a number of rafting options along the Kitkajoki River. As I mentioned above, you won’t find any bigger rapids in Finland, so it’s definitely worth it to pick up a paddle while you’re in Ruka! 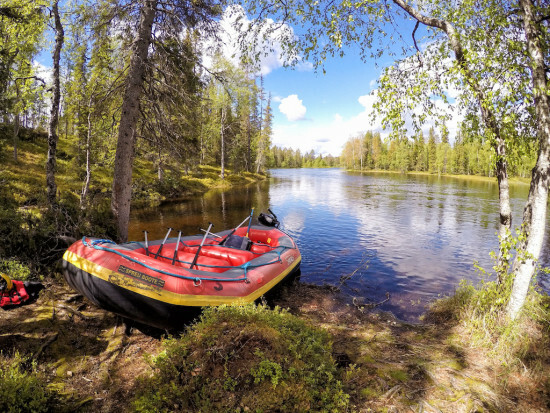 There are a few sections of the Kitkajoki that are available for rafting, from Käylä in the north all the way to the Russian border (for the really avid rafters, since this trip takes about 7 hours). The section I rafted was from Käylä to Juuma, just before the Myllykoski rapids. Ruka Safaris, the company I rafted with, calls this section of the river the “family route.” It has seven distinct rapids, the largest being a class 3, and it was a very different rafting experience to those I’ve had in places like the Canadian Rockies and New Zealand, where we were constantly paddling in preparation for not flipping the raft when we hit the next rapid. Reflections on Lake Kitka at the end of the rafting trip. Instead, this was more of a light rafting experience — one where you can take the kids, enjoy the scenery, and still get a bit of excitement when tackling the rapids. Large sections of the trip were actually done under engine power — something I hadn’t experienced before in a raft — because the wider sections of river didn’t have enough current to push us along very quickly at all. Fortunately, our guide was a very experienced rafter and knew, once we got to the rapids, exactly how to hit them to splash all of us as much as possible! Nothing is more central to Finnish culture than the sauna. It’s that important that it’s the only Finnish word to have migrated to the common English vocabulary! A small Finnish sauna, typical to what you will find in many rental cottages and apartments. When in Finland, you’ll find that you’re never far from a sauna — which is not surprising since there are said to be 2-3 million of them throughout the country! If you’re staying in a hotel, there is usually a sauna available for everyone’s use; if you’re staying in an apartment, you’ll often find one attached to the bathroom. 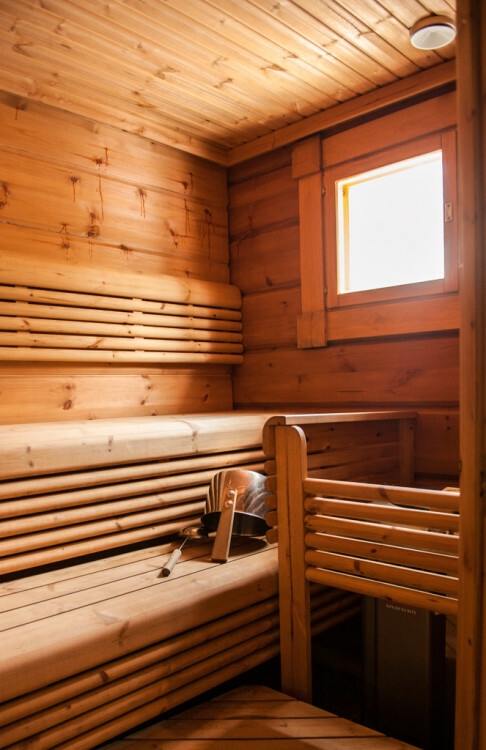 And while you may be familiar with these wooden, steamy rooms from elsewhere, you’ll quickly find that not all saunas are the same. 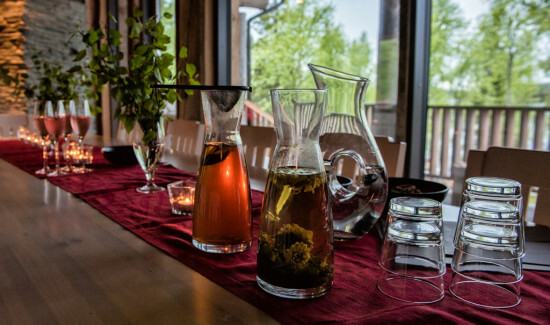 The Sauna Tour helps to introduce you to some of the different forms of sauna in a unique way. Each individual or group booking a sauna tour can customise it to their own liking; they can choose anywhere from one to all eight of the saunas in the area. I can’t imagine squeezing visits to eight different saunas into one day, but apparently some people do it! 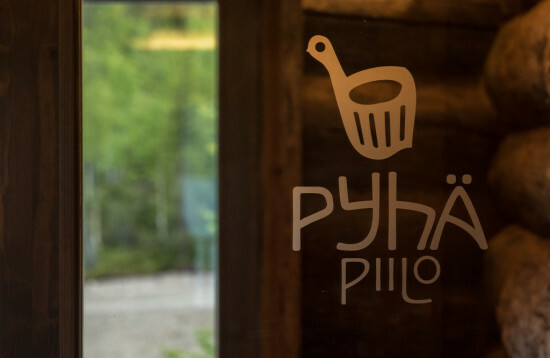 My Sauna Tour included a single sauna visit, but that sauna — Pyhäpiilo — offered a smoke sauna and a number of sauna health treatments that I had never come across before, making it very different from all of my previous sauna visits. Over the course of the evening, my guide Eveliina introduced me to more natural treatments than you would get in a full day at your standard day spa. From being hit on the back with birch branches (called a vasta, or a vihta in other regions of Finland) to rubbing my arms and legs down with honey mixed with birch leaves and Himalayan rock salt, nearly all of the remedies I tried could be sourced from the Ruka area — something that is in line with the Finnish way of relying on what nature provides to them in abundance. The many different drinks provided during my sauna tour, including plenty of water for rehydration! The highlight of the night, though, was a slightly more well-known Finnish “health treatment” — that of getting the blood flowing by running from a hot sauna straight into the nearest cold body of water. The lake behind Pyhäpiilo was apparently the warmest it had been all year, but as its temperature was still in the single digits, I struggled to make it much further than waist-deep before sprinting back to my bathrobe for warmth (and yes, my sauna experience was done in the traditional Finnish way…that is to say, naked). While I spent most evenings on the rest of my trip luxuriating in the heat of saunas, my trip to Pyhäpiilo was truly a unique experience, both because of what it had to offer as well as the fact that I had a Finn there to guide me through the most Finnish of traditions. An eagle taking flight during a bear watching tour outside of Kuusamo — yet another activity option in the region. By the time I left Ruka, I knew I had made the right decision to visit Finland’s north in summer. It was so incredibly different to the wintry wonderland that I had experienced two years prior that it was hard to reconcile the two experiences as being in the same place. I also managed to cram so much into three days — including a ride in an RZR car and a bear-watching trip that have not been mentioned due to space more than anything else — that I easily could have spent a week or more there. 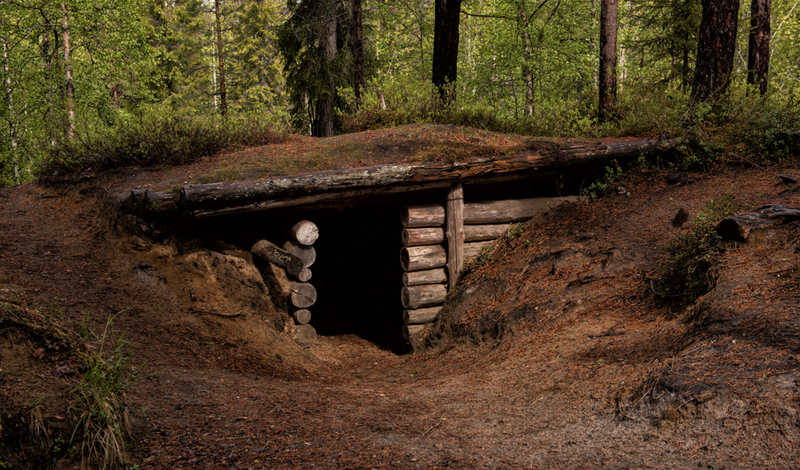 For anyone that is looking for a more adventurous summer vacation option that’s slightly off the beaten track, Ruka is definitely for you. 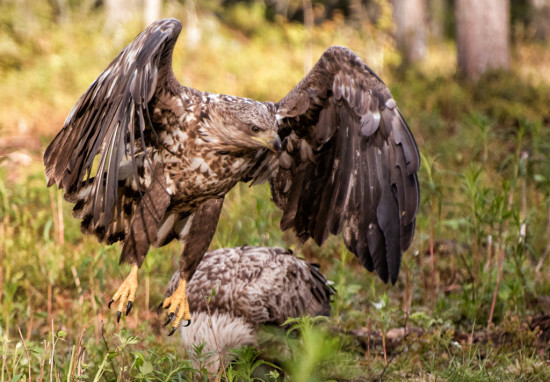 My stay in the Ruka region was sponsored by the Ruka-Kuusamo Tourist Association and Ruka Safaris, but all opinions stated in this piece are my own. 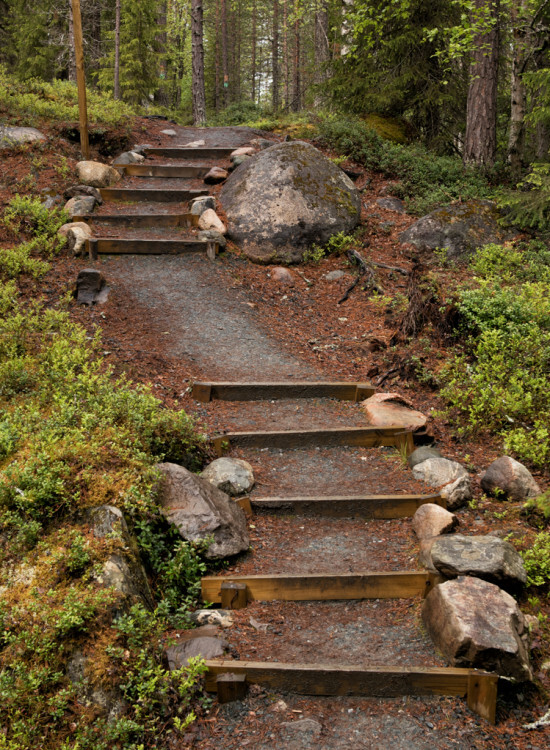 Hiking in Oulanka National Park is free of charge, as is entry to the Oulanka National Park Visitor Centre. The family rafting tour that I went on was offered by Ruka Safaris and costs €45pp. The Sauna Tour is offered by Wellbeing in Wilderness and the price varies based on the customised experience chosen.